Congratulations! You’ve taken a big step toward enhancing your smile with Invisalign orthodontic straightening. We’ve made impressions of your teeth, generated computerized 3D images for each stage of progress, and created custom aligners. Now it is time to talk about keeping your aligners clear, and your mouth clean and odor-free while you straighten. My patients in the Hollywood area are typically very pleased with Invisalign results, especially when they develop these healthy hygiene habits early into the treatment plan. It is time to rise and shine, knowing that you will look great all day while Invisalign gently moves your teeth into attractive positions. Remove your aligners when you get up. Rinse one with tepid water (never use hot water, which could warp the plastic). Brush it gently with a soft toothbrush reserved for this purpose, and a little liquid anti-bacterial hand soap. Unscented is best, and be sure that the soap is clear – colored soap may stain the aligners. Do not clean aligners with toothpaste or the toothbrush you use for your teeth. Abrasive particle from toothpaste scratch the plastic material, leaving grooves that trap discoloration and germs. Repeat this process with the other aligner. Place both aligners on a clean towel or in their storage case while you brush your teeth normally. Remove aligners before eating or drinking anything other than plain water. Chewing can damage aligners, and pigments in foods and beverages stain the plastic. If possible, rinse aligners with cool water before placing them in their storage case. Do not wrap aligners in a napkin. They are likely to be misplaced or thrown in the trash. Ideally, brush your teeth after eating. If you cannot brush immediately, swish with fresh water before reinserting your aligners. Brush aligners as you do in the morning. Sanitize your aligners with a soak in denture or retainer cleaner. Even better, use Invisalign’s cleaning crystals. While aligners are immersed, brush your teeth and floss thoroughly. Rinse aligners, and re-insert them right away. It is important to wear your aligners for 20 to 22 hours each day for efficient straightening. This method avoids falling asleep while they soak. These simple hygiene steps keep your breath sweet and aligners invisible, protecting your investment in a beautiful smile. 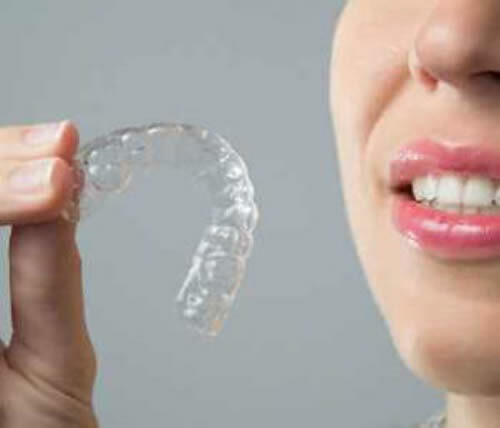 Call A-Dental Center in Hollywood at 818-593-0700 for more information on Invisalign treatment.